The lin-ay sang Negros (young ladies of Negros) resemble a typical Filipina beauty with a brain and a talent to show not only to the whole island of Negros Occidental, but even to the whole universe. To look for who are among the fairest of them all, Search for Lin-ay sang Negros is held as one of the highlights in the annual Panaad sa Negros Festival, the mother of all festivals in Negros Occidental, that started sometime in 2003, showcasing the various cultures, beliefs and traditions of the municipalities and cities of Negros Occidental. 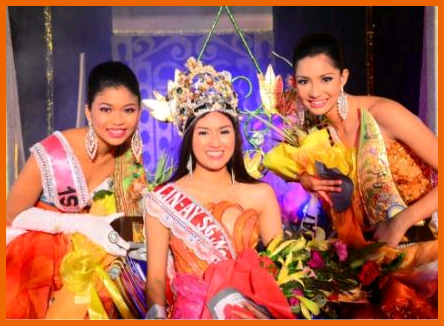 And the fairest of them all is Allysa Marie Villarico, a Bacoleña crowned as the 2012 Lin-ay sang Negros in a recent concluded week-long Panaad sa Negros. First lady Dr. Marilyn Marañon, 2011 Lin-ay sang Negros Ann Marie Malayo, and Department of Tourism consultant Leonilo Agustin, who was chairman of the board of judges jointly crowned Villarico. 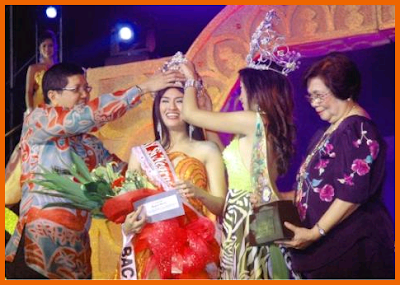 The crowning of Villarico took place at the overcrowded Panaad Park and Stadium in Barangay Mansilingan, Bacolod City. Villarico bested other 23 beautiful ladies representing their respective towns and cities here in Negros Occidental. Villarico is the 3rd Bacoleña who took again the crown in the 18th history of Lin-ay sang Negros. Aside from getting the crown of Lin-ay sang Negros, Villarico also got the additional title as Miss Energy Development Corporation, Miss Mary Kay, Miss ASN People’s Choice, and Miss Globe. Jemaimah Taladico of Victorias City is first runner-up. She is a Mass Communications student of the University of Saint La Salle in Bacolod. She won a 75-percent one-year college scholarship and P40,000 in cash. Second runner-up is Sherizze Sean Acot of Talisay City. She is an AB Communication student of the University of Saint La Salle. She won P20,000 in cash and 50-percent one-year college scholarship. She was also chosen Miss Del Monte Fit ‘n Right and Miss Watchmen Daily Journal Readers’ Choice. Other winners were Catherine Joy Marin of Bago City, adjudged as Best in Evening Gown and Best in Swimsuit, as well as Miss Island Living Channel, Miss Kapuso, Miss 2Go Freight, Miss Dermaline, and Miss Camisa; Chinky Cantere of Murcia, Miss Silka and Miss Olive-C.
Cel Marie Lachica of Silay, Miss SunStar Readers’ Choice and Miss Coca-Cola; Precious Grace Heradura of Himamaylan, Miss 2Go Travel; Karla Ape of La Castellana, Miss Robinsons Place Most Photogenic; Vanessa Marie Oyos of Kabankalan, Miss AirPhil Express; and Damaris Landao, Best in Festival Costume. The Department of Tourism consultant Leonilo Agustin, 2009 Lin-ay sang Negros and 2011 Mutya ng Pilipinas International Vicky Marie Milagrosa Rushton, 2011 Miss World first princess Helen Henson, model Raphael Kieffer, and 2004 Lin-ay sang Negros Blance Marie Brown were the judges. Binibining Pilipinas World 2006 Ann Mariz Igpit and GMA star Victor Aliwalas made the people alive inside the stadium with their wits and whips in hosting the pageant. The small city of La Carlota will have similar beauty pageant like this one on April 28, Search for La Carlota Pasalamat Festival Queen. It really fascinates me, how this young ladies dominates this beauty pageant. We all love beauty, most of all we are amazed by their wits. Congrats to all the winners!